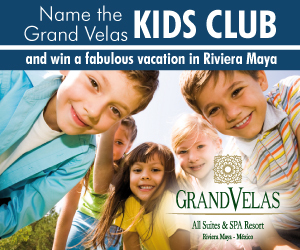 “Name the Grand Velas Kids’ Club” Contest! The Grand Velas Kids’ Club needs your help to find a new name! Receive the most votes for your name proposal and win a fabulous 3-day, 2 night stay at Grand Velas Riviera Maya! Simply become a friend of the Grand Velas Riviera Maya facebook page, post your name idea, and get all your friends and family to vote for you to win. [Learn more about the amazing Grand Velas Kids’ Club]. Contest runs from November 9rd-30th, 2010. Must be 18 years old to enter. For details and official contest rules please visit: Grand Velas Riviera Maya Facebook Page starting Tuesday, November 9.